During Sunday’s induction ceremony into the Naismith Memorial Basketball Hall of Fame, University of Louisville’s basketball coach, Rick Pitino, spoke last after 3 hours of speeches wrapping up the ceremony with a 20 minute inspirational and heartfelt speech. 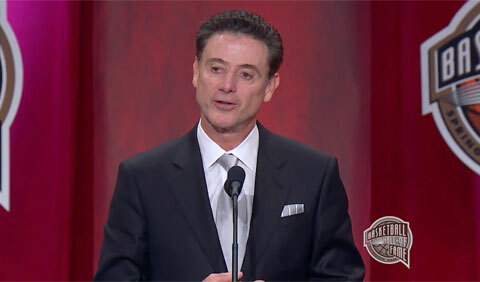 Photo shows Rick Pitino speaking at the Naismith Memorial Basketball Hall of Fame induction. Pitino told the audience, “Back then there was no 20-hour rule,” referring to the NCAA restriction designed to limit the amount of supervised activity required of athletes. “I thought that was the worst rule that the NCAA could ever put in until last night. Rick Pitino is the only men’s coach in N.C.A.A history to lead three different schools to the Final Four. In 1987, Pitino became head coach of the New York Knicks. The year before he arrived, the Knicks had won only 24 games. In just two years, Pitino led the team to their first division title in nearly twenty years. On April 8, 2013, Pitino became one of seven inductees elected to the Basketball Hall of Fame, just before winning the 2013 N.C.A.A. title. Patino is also a dynamic motivational speaker and popular keynote speaker. If you would like to book sports legends like Rick Pitino for a speaking engagement, guest appearance or corporate event, contact our booking agent for appearance and speaker fees or call 1.800.966.1380.